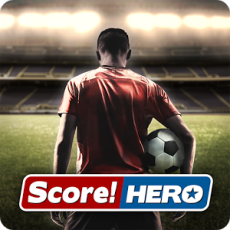 Score Hero, from the award winning makers of Score! World Goals, Dream League Soccer & First Touch Soccer.BE A HERO! Pass, Shoot & Score your way to legendary status, as you explore the dramatic career of your HERO player over 280 challenging levels! ● Win awards, win trophies, score goals, change clubs, represent your country and go for glory! ● New Score! Engine that allows more freedom and strategic play than ever before! ● Connect with Facebook to compete against your closest friends! ● Google Play achievements & leaderboards to see who ranks on top! ● Sync progress between devices with Google Play Cloud! ● Engaging Story charting your rise from an aspiring teen to a player making it big!